You may want a button in your email which leads to a page of your site. This can be done for a normal image and for buttons. This article will show you how to create a HTML-based button link. Type your link text inside of the table you just created. 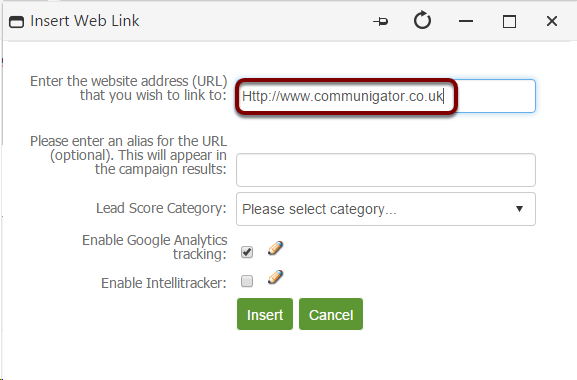 Select the 'Insert Web Link' option from the right-hand side of the editor. Select the table that contains your linked text. Whilst the table is selected navigate down to the paint bucket in the footer bar of the editor. Select the colour you want your button to be. Click the colour to apply it to your table. Now you need to select your linked text and apply a colour to this too so it stands out against your button. If you need help doing this please check out our 'Changing Link Colour' article.